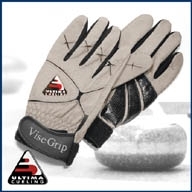 The Ultima Vise Grip Glove has been constructed from digitized leather that offers a natural grip design. Additional silicon coating has been added to the palm area for enhanced grip and wear protection. Available in grey and black (depending on size), please indicate first choice and we'll accommodate if possible.